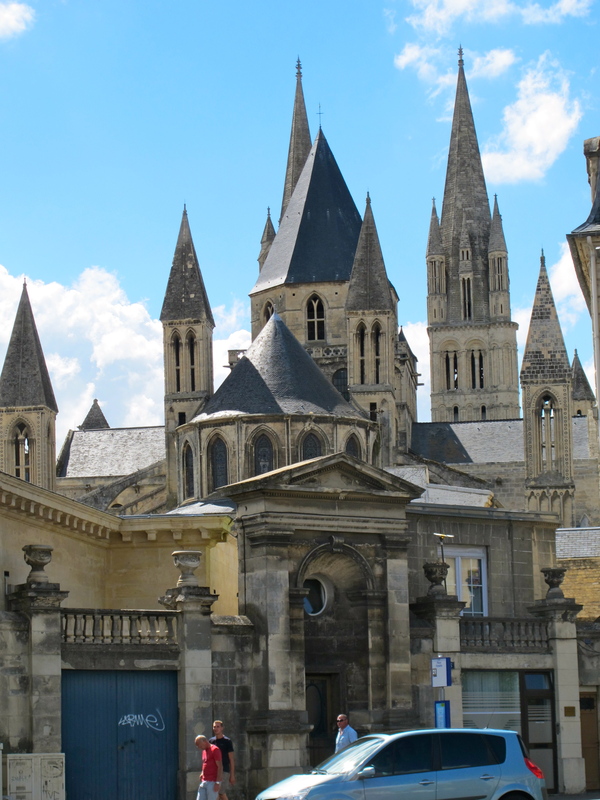 Also known as "Sainte Etienne," the Abbaye-aux-Hommes, is a French Romanesque church located in the west side of Caen, a city in Normandy, located in northwestern France. 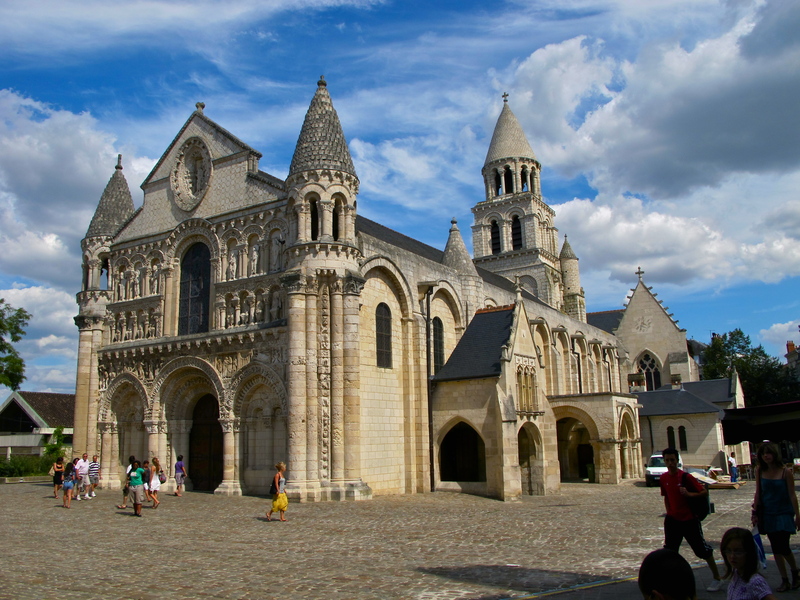 To repeat, sometimes the architecture in this region of France and in this time frame (the 11th and early 12th century) is described as "Norman." Interestingly, to add a bit to the information above, locals tell it this way: Vikings were given land in this part of France in the year 911 in an effort to stem their periodic invasions into the rest of what we call France. The "Northmann" brought with them an inspired sense of construction, mostly in the development of monasteries and churches. We could use some of that construction work ethic today! 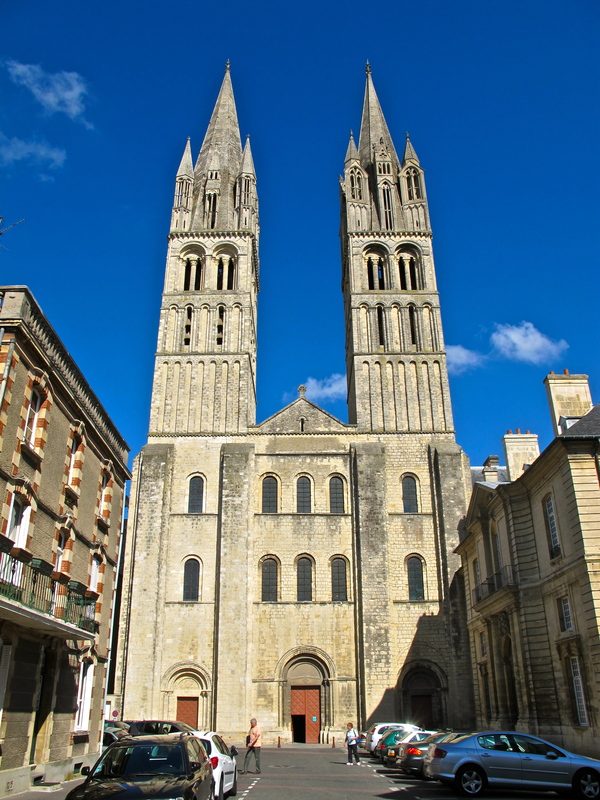 Constructed between 1068 and 1120, this particular church was founded by William, Duke of Normandy. Remember this is the ruler who would eventually be known as "William the Conqueror" because of his successful invasion of England (see the Abbaye-aux-Dames, begun by Matilda, wife of William, and also located in Caen - actually on the opposite or northeast side of the city). Remember also, the two churches were built to expiate or atone for the fact that William and Matilda were, apparently, first cousins (some sources say “distant” cousins), and their blood relationship was frowned upon, with regards to marriage, by the church. 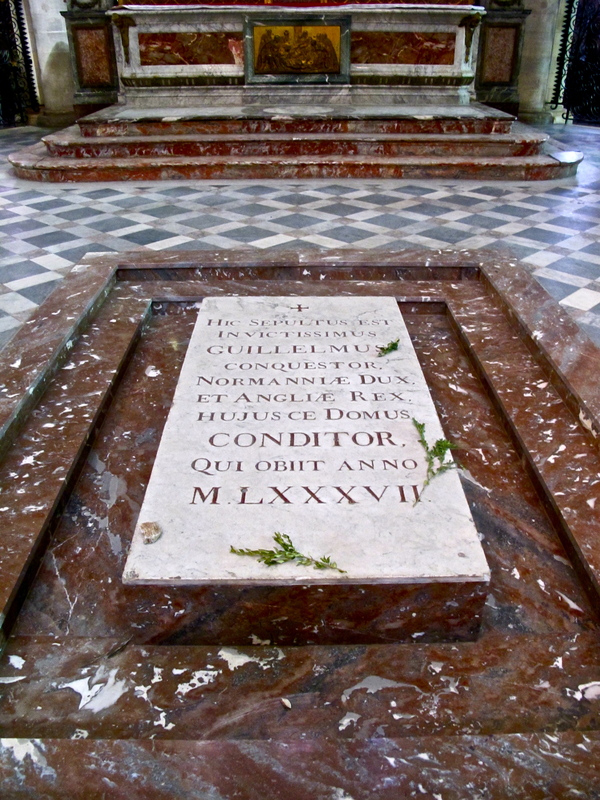 A side note: William was buried in this church. At some point his body was removed, then returned. But: William the Conqueror's tomb was destroyed by Huguenots in 1562 during the Wars of Religion - only a hipbone was recovered. Then the last of William's dust was scattered in the French Revolution. Difficult to say what exactly is buried inside this tomb. 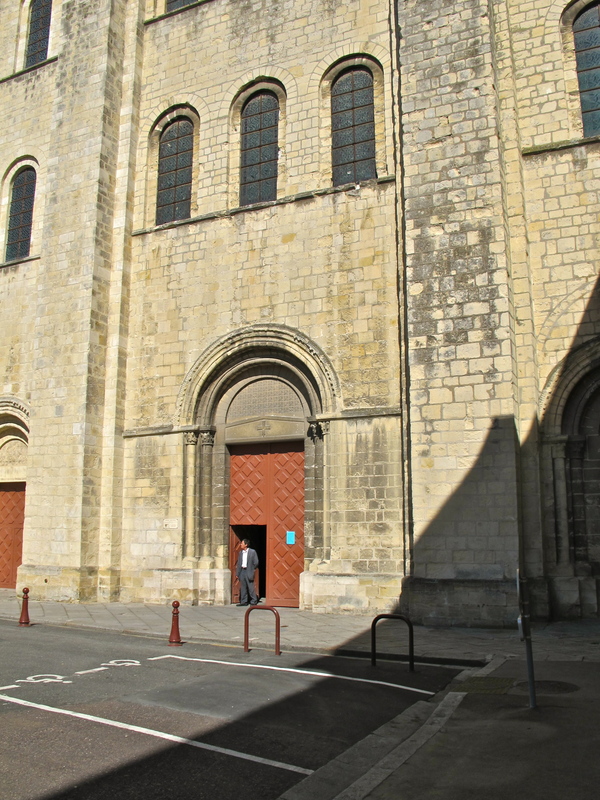 This is the west facade - the entrance facade of the church. This facade is one of the earliest to absolutely define its interior layout by its external appearance. Remember the three portals of Matilda's church. 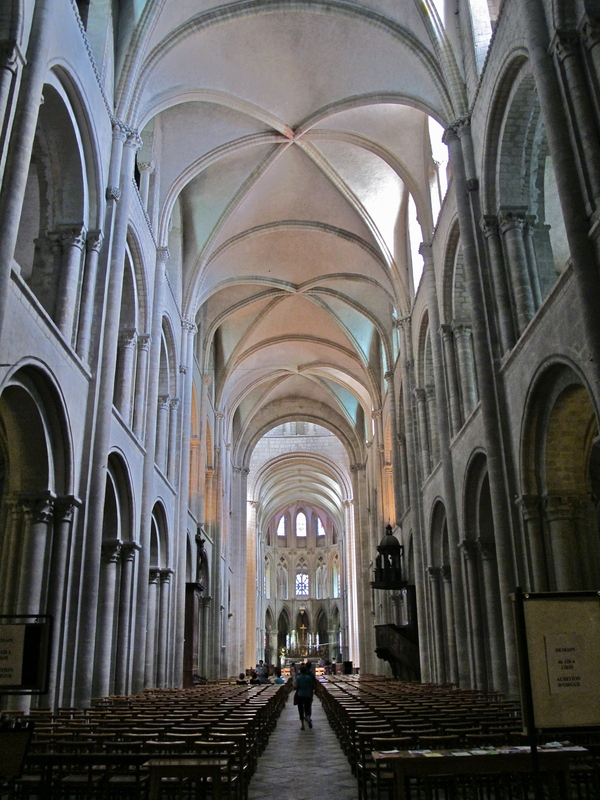 In width, we see a three-part elevation, indicating the central or main aisle (the nave), as well as the flanking or side aisles (also known as the ambulatories). The height of the western towers, combined with other verticals on the building, began that reach towards the heavens that was to characterize later Gothic church development. The octagonal spires at the very top of the twin towers were added in the 13th century. 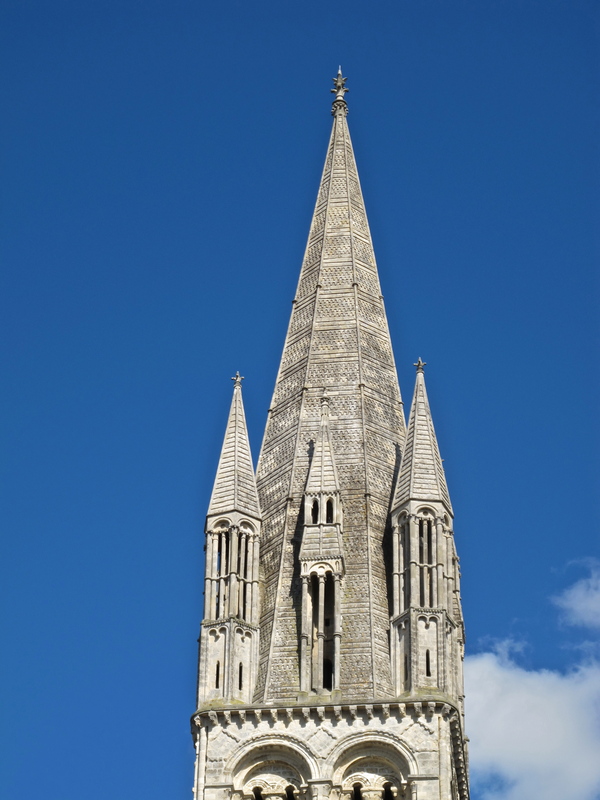 There are a total of nine spires on this church, all seemingly erected in the 13th century. It is strange to say, but though this façade set the design trend, almost as a prototype, it is one of very few churches to have come down through time with its towers almost identical. Very often local resources would be depleted prior to completion of these massive edifices, and if towers and spires were ever completed, they would be done in the style of the moment of the new construction, therefore losing the original mirror image concept. 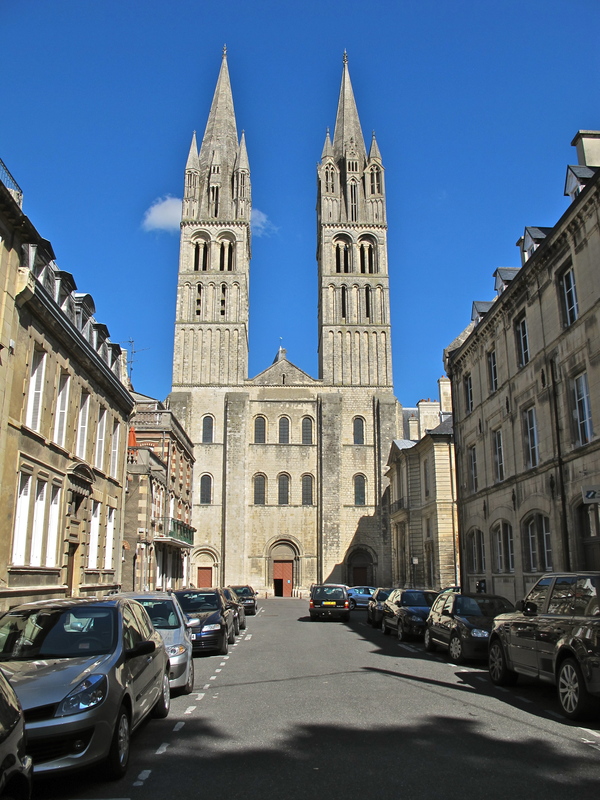 Frankly, these towers are magnificent, and not enough credit is given this particular church for its “completeness.” Compare this facade with that of 12th century Notre-Dame la Grande in Poitiers (see “Poitiers” below). 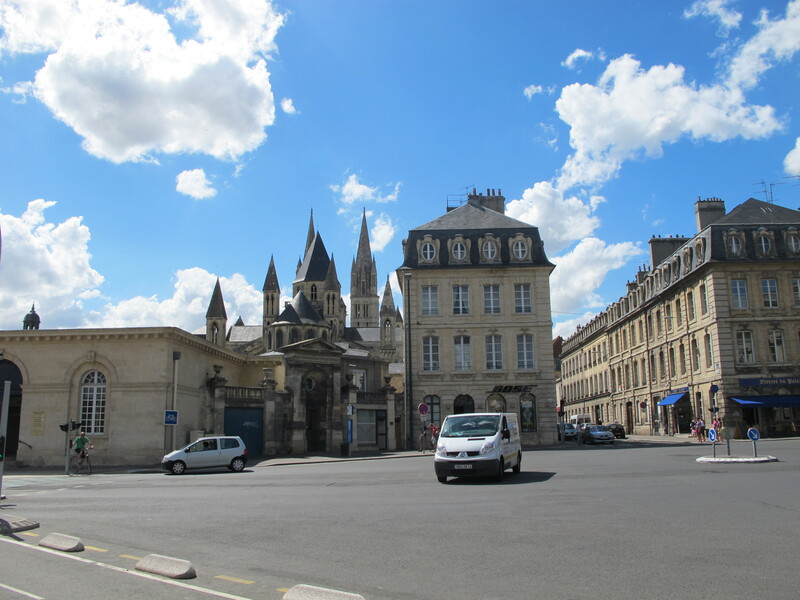 Here at Poitiers, Notre Dame la Grande – a preview – we see the three part semi-circular facade indications of the interior, and also spires placed atop the turrets of the corner buttressing towers. These were added later than the original, but historians seem to agree that the intent was to complete the vertical striving. 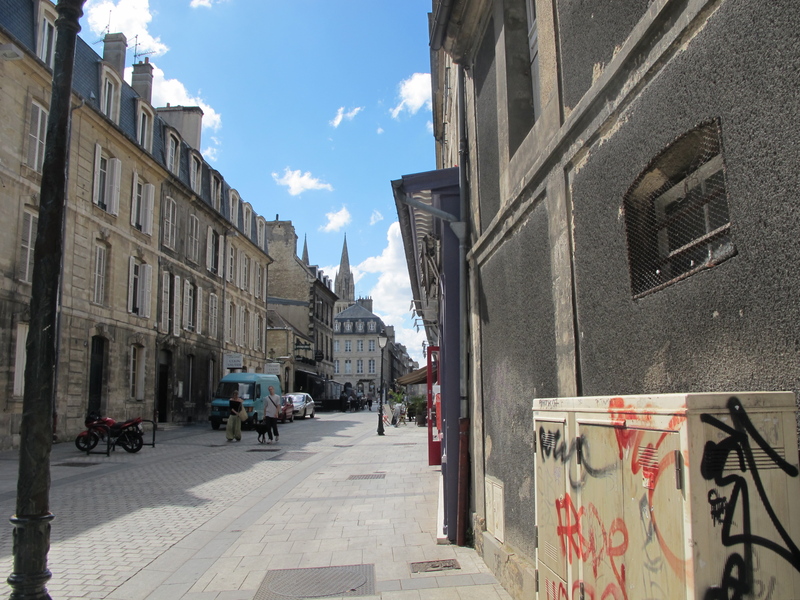 But the contrast with the images here in Caen is more than striking. This particular church we are studying now, the Abbay aux Hommes, was – well, to exaggerate, but to make a point - light years ahead of its time, with minimal recognition of that accomplishment. We are doing this church backwards – beginning as we did with the tomb of William, proceeding to the twin western towers. But in keeping with out concept of “serial vision,” let us begin anew by showing the very first glimpse of the church and its towers from la rue Ecuyère, at a distance of about 0.3 miles (0.5 km). The spires beckon. 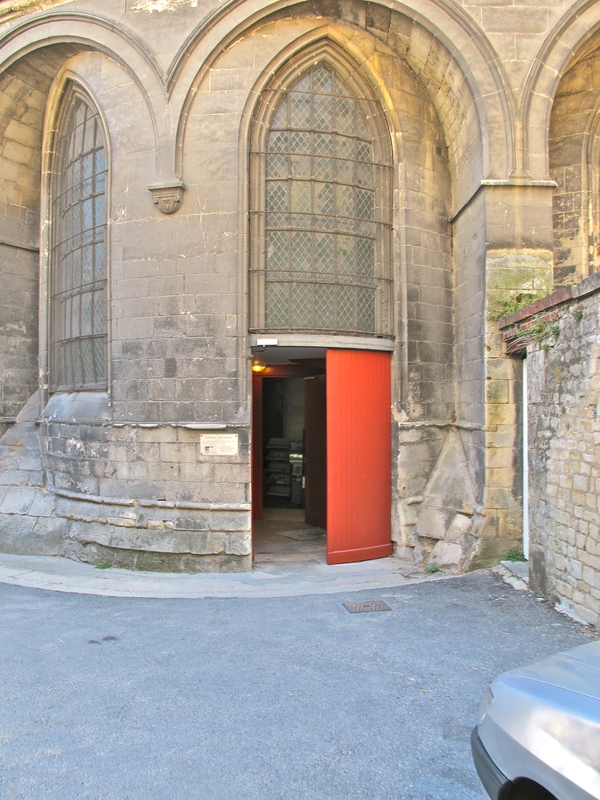 At Place L. Guilouard, we realize that we are approaching from the rear or eastern end of the church, and that the Western towers are on the far side of the church. Standing in the Esplanade Jean Marie Louvel, which is the main garden entrance to the Hotel de Ville of Caen (the “City Hall”) we see the nine towers cited above. And again, they are magnificent and extraordinary. There are very few, if any, churches with such a multitude of “fingers” stretching up to the heavens. Flying buttresses are obvious on the exterior, helping to support the latest construction of the church, that of the upper nave. That area was completed in the 12th century. Earlier wooden roof construction over the nave was removed in 1115, the upper section of the nave walls raised to accommodate sexpartite vaults, and at some point these flying buttresses were used to pinpoint strategic support for that higher construction. As with so much of Romanesque development, these buttresses would become a feature of structural and aesthetic design of Gothic church development. The western facade once again. The facade up to the spires is original to the 11th century. 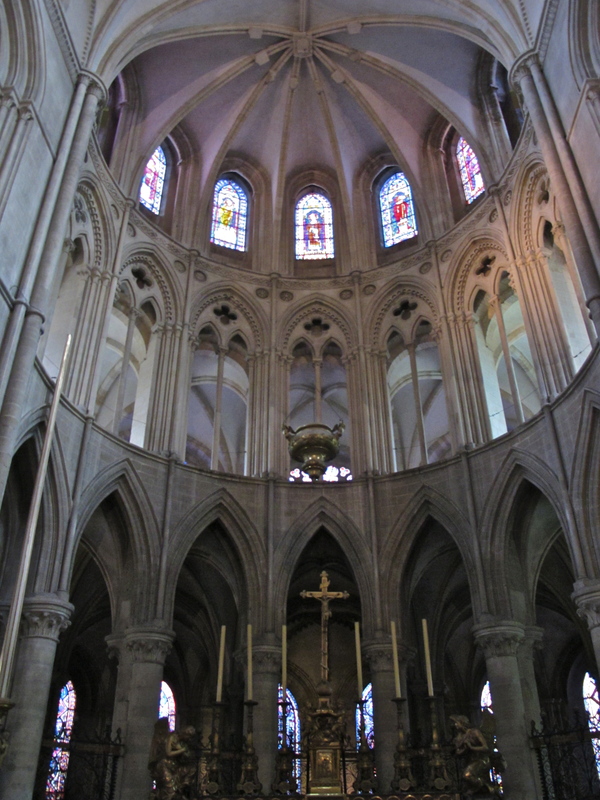 The height necessitated buttressing, and the four massive buttresses applied to the front elevation divide the facade into the three parts representative of the interior, the nave flanked by side aisles. The three sets of windows further indicate interior arrangement, the nave floor, the triforium gallery, and the clerestory. The south tower (on the right) is 262 feet (80m.) high, while the north tower (on the left) measures 269 feet (82m.) in height. Typical of Romanesque churches, the walls are heavy -7 feet thick (2.17m.) - the openings small, created with semi-circular arches. Remember that early church construction was conservative, walls thick and massive, and obviously the larger the opening the greater the danger of collapse. Until - by trial and error and greater awareness of just what stone was capable of supporting - walls became thinner, taller, and buttressed strategically. As we enter, we shall review the plan of this church. 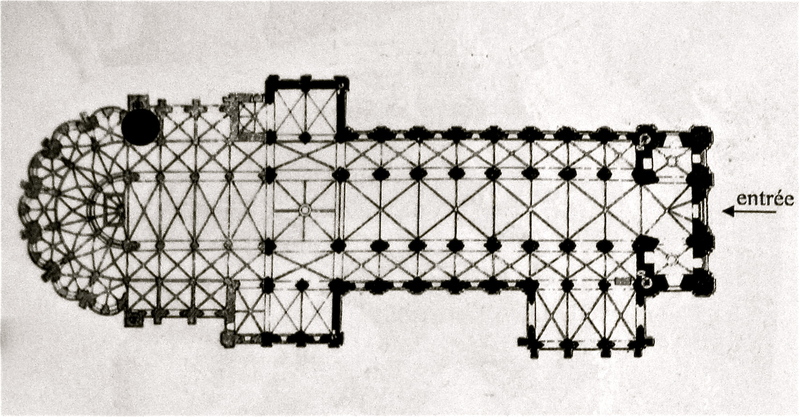 The plan shows the overhead structural members – vertical and diagonal lines. Note that immediately upon entering, the vaulting overhead at each of the three entrance doors, is in four parts. Proceeding down the nave, we see that there are six parts to each vault (the diagonal and vertical lines which delineate a bay in the construction. The crossing is divided into eight segments. 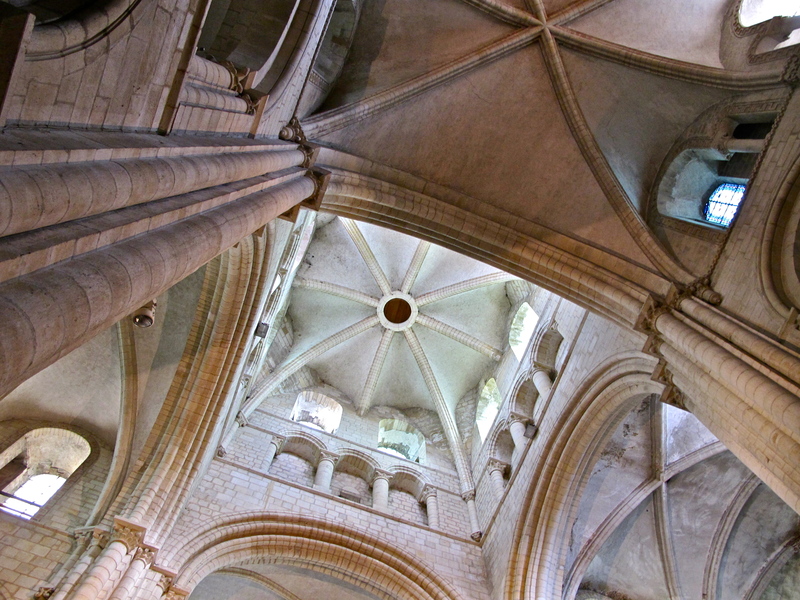 The multi-angles of ribs in the apse over the choir are part of a Gothic addition in the 13th century. We shall explore all of these areas immediately. Note: the black circle on the upper left indicates the area from which this photo was taken, that of the Chapel of Saint Joan of Arc. 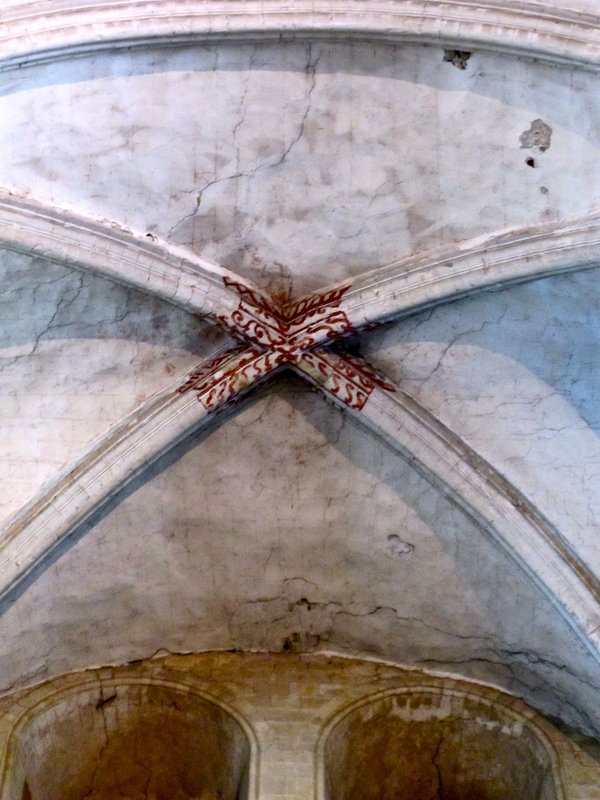 Internally, just above the entrance, is the four-part vault, showing traces of colorful decoration. To refresh a bit, the four-part groin vault, by the way, is known as a "quadripartite" vault, and seemingly resulted during Roman construction from the intersection of two barrel vaults. Here we view the nave as it extends towards the altar. We are now dealing with a feeling of procession, as mentioned above in the introduction to the Romanesque. The semi-circular pilasters which have transformed the piers into articulated verticals, traceable up to the roof and over, forecasts the Gothic. The height is approximately 66 feet (20m.). 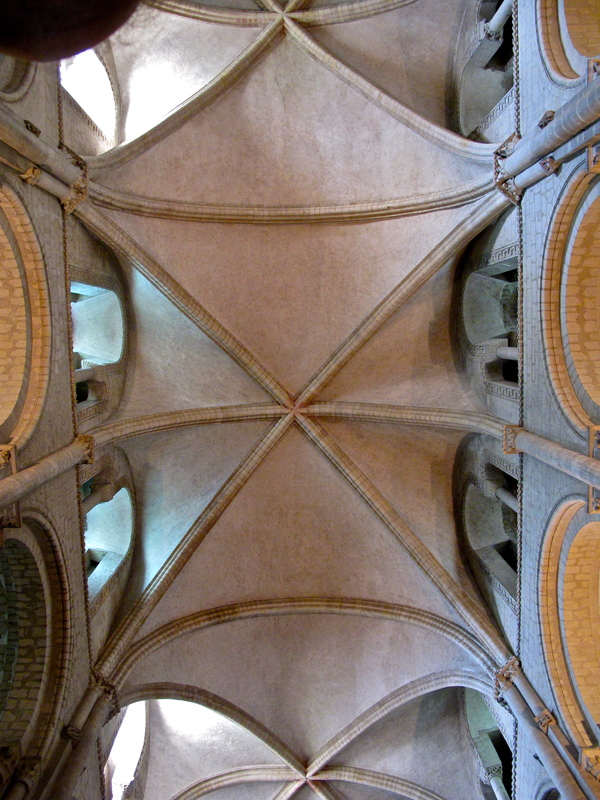 Sexpartite vaults span the nave. The crossing dome, divided into eight segments. 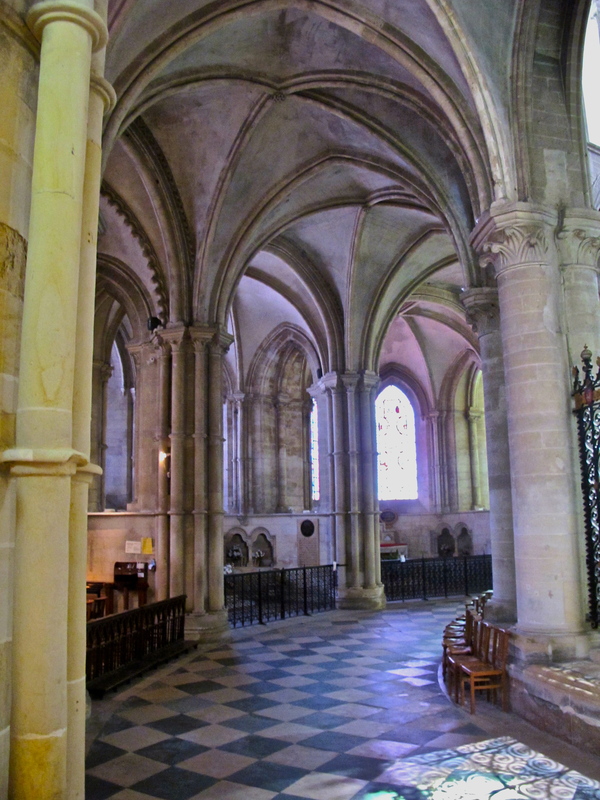 This is the intersection of the nave and the transepts. 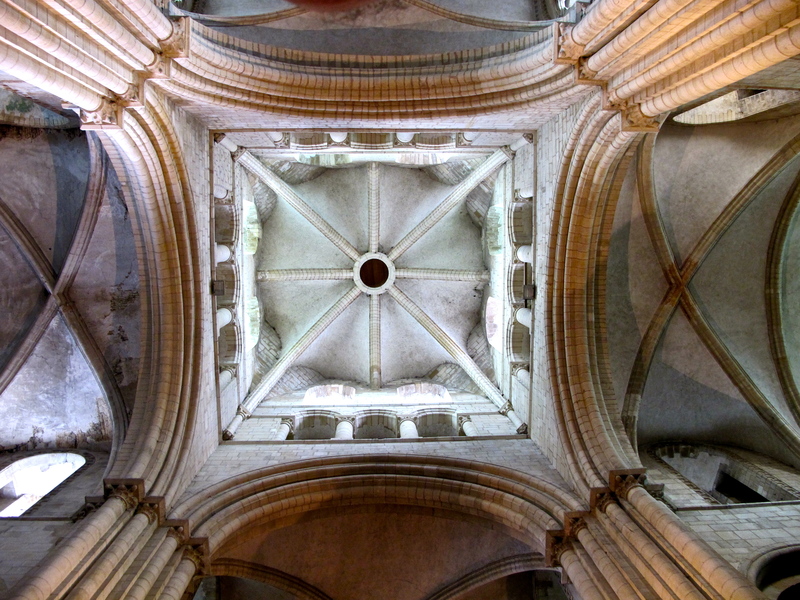 Its height to the open circle, which incidentally as a continuous form, takes all of the ribs pressing against it and carries their thrusts around endlessly, measures 102 feet (31.2 m.) above the nave floor. The highly articulated crossing construction is really rather unique here. 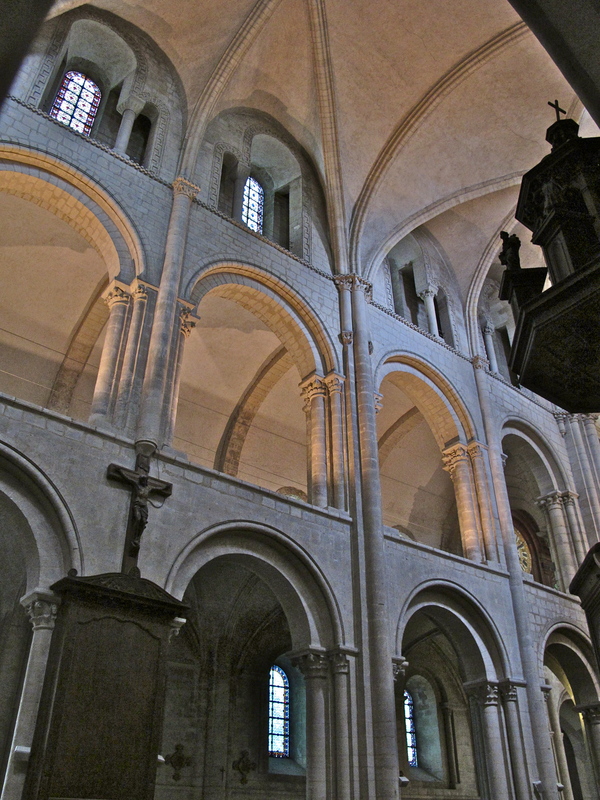 Most early churches merely placed groin vaults at the intersection of the nave and transepts. This particular construction is actually a tower, with clerestory windows, allowing not only a sense of soaring height, but also a major source of light. Although not directly related, this is really a highly innovative forerunner of the principle of the Renaissance dome, placed over the crossing. 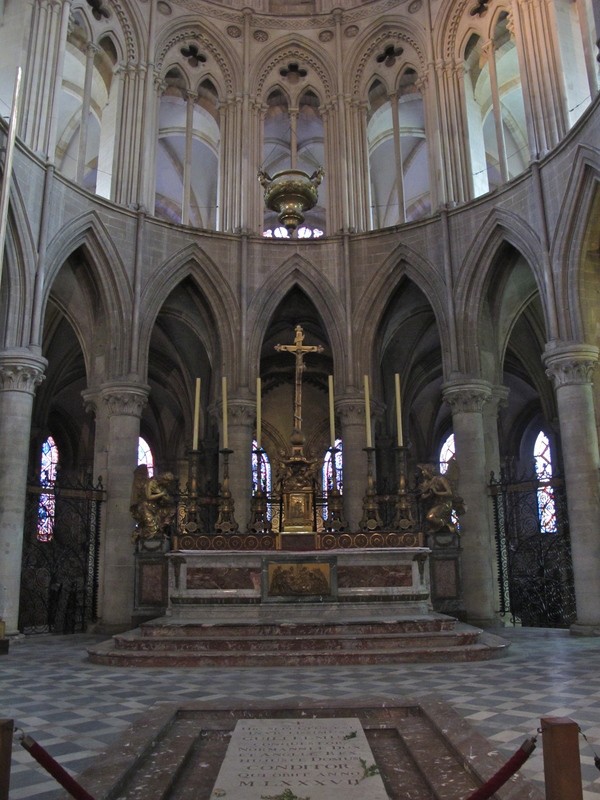 The altar, with the apse behind. The apse, towering above the altar, dating from the 13th century, when it replaced and expanded upon the original choir area, is pure Gothic. The stone skeleton is the structure, pure and simple. Materials have been minimalized, with just enough stone to support itself. 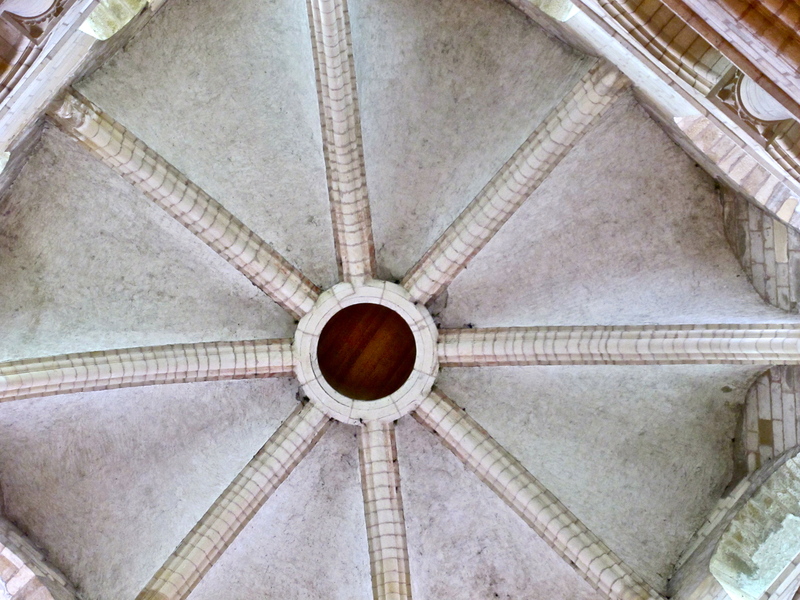 While the columns begin as round shafts, they do articulate above their capitals, and can be traced up to a convergence, from which some do come down on the opposite side. While it remains for some later designs to become even thinner and taller, allowing more light to enter, this never-the-less is a magnificent accomplishment on the road through the Gothic. 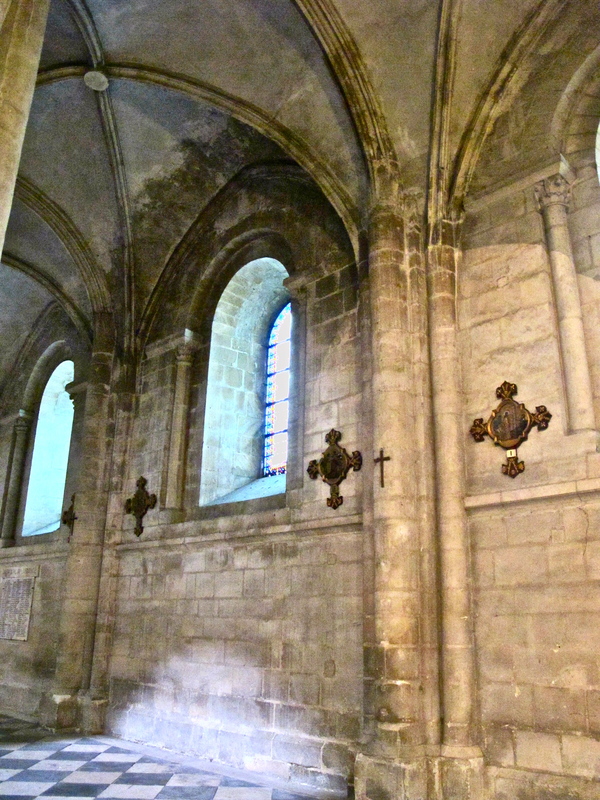 There are seven radiating chapels branching out of the apse. This photo shows three. This is the chapel of St. Etienne (St. Stephen), the first Christian martyr, for whom this church was named. Should you look up the bio, you might find an English indie band, and a French football team, for whom the band was named. Such is the stuff of which Wikipedia is made. 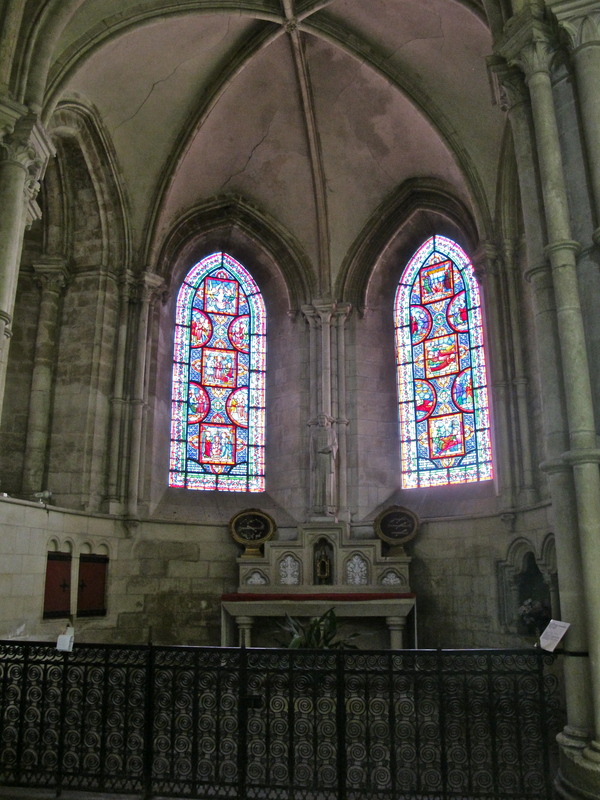 All of the chapels are similar, featuring altars lit by beautiful stained glass, for which the French became famous. Notice the pointed arches of those windows, a hallmark of the coming Gothic development. 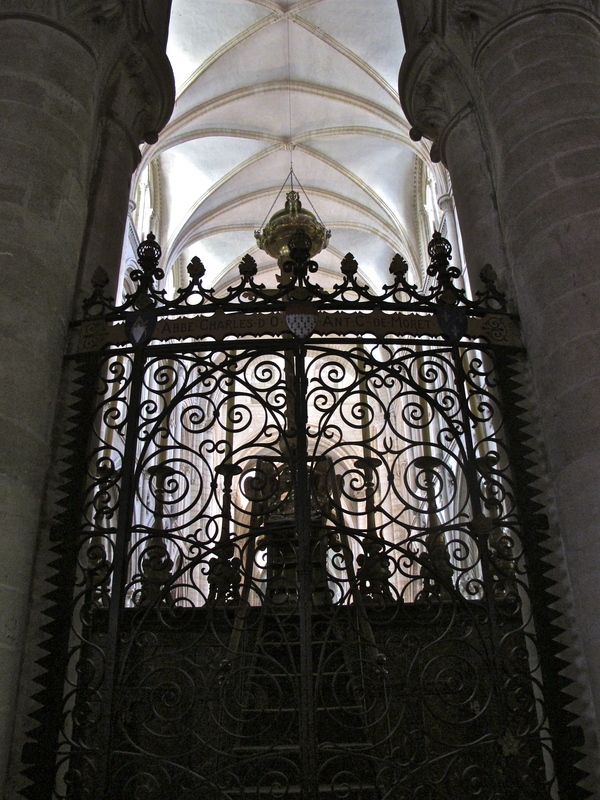 View within the apse, behind the altar, an area surrounded by delicate wrought ironwork. Contrast this work with Spanish and Italian designs, which are usually heavier and simpler. An interesting assignment would be to compare and contrast wrought iron works throughout Europe, including England in particular. You might find that each country has its own wrought iron identity. 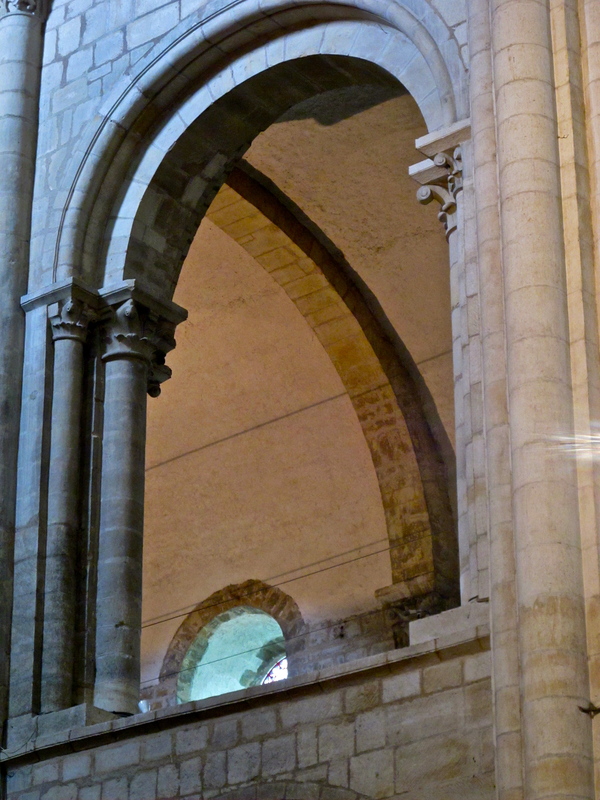 Note that most windows are semi-circular, in the Roman (or "Romanesque") tradition, this typical in the ambulatory. Here, again, they often refer to local architecture as "Norman" - be it Romanesque in this case, or otherwise. 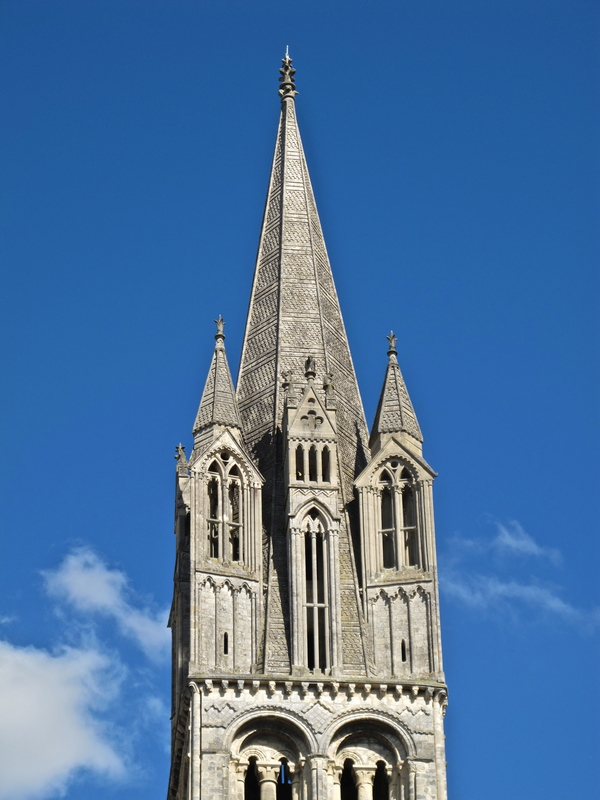 Many of the nine spires were built in the 13th century, and because of that later development, it can be assumed that the several pointed arches visible on the exterior openings are from the Gothic period. To clarify: semi-circular arches following the Roman period are described as Romanesque; pointed arches are indicative of the later Gothic period. A mixture within one building would indicate extended construction periods. One other major innovation in the coming Gothic period - walls began to be placed at right angles to the building, allowing so much more window space. Another way to look at that development is to think of those right-angled walls as lateral buttressing for the main body of the church. Or, as Louis I. Kahn exclaimed when waxing poetic about Paestum "when the walls parted, the columns became" (see Chapter THREE above). Some writers have attributed that comment to Kahn's feelings about Gothic development – well, it is applicable there, too. Now, obviously, there had been columns before - look at Greek and Persian and Egyptian architecture - but not in dimensions of over 100 feet in height, which we shall see in the Gothic! 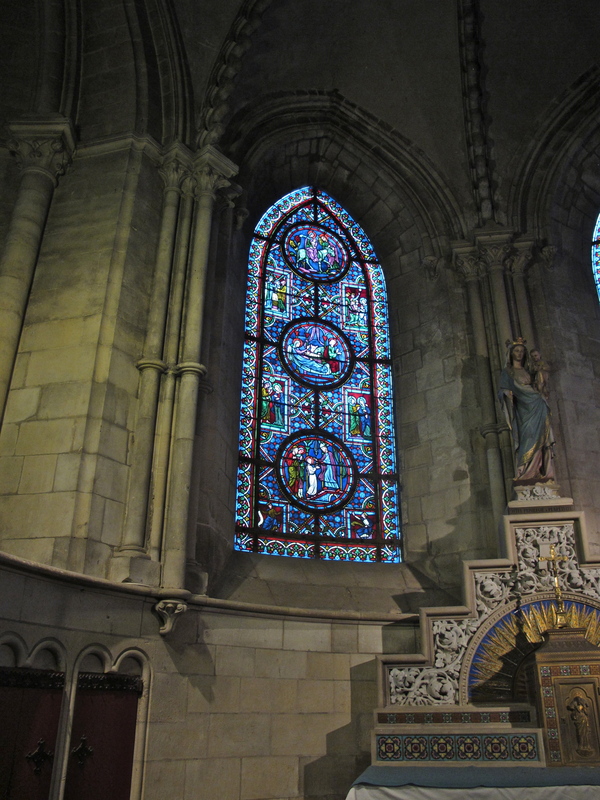 France is noted for the stained glass within its churches. Aside from the aesthetic beauty achieved, and the spiritual quality of the light produced within the church, there was a practical purpose - the fact that many church-goers were illiterate, and these windows provided pictorial representations of biblical themes. The stained glass is so obviously telling stories - almost always biblical in nature. But what we also have is an artwork integrated with the architecture. 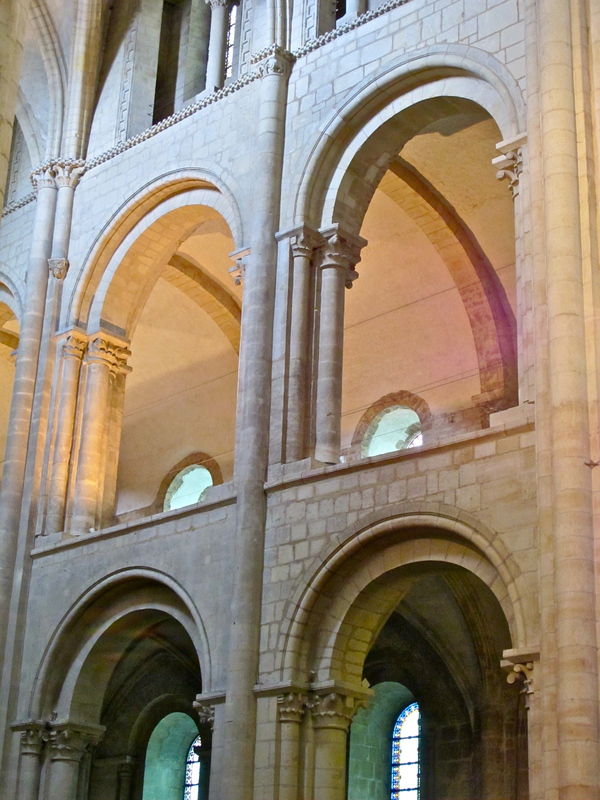 The apse, where these windows are located, was lengthened about 23 meters (75') at a later date. 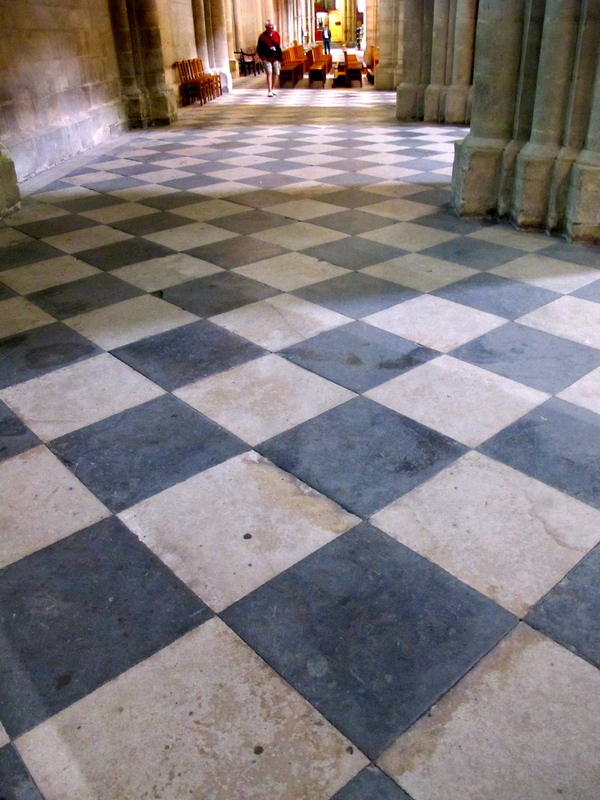 A "checkerboard" floor pattern appears, as it does so often in European church design. The origin or purpose of such design is seemingly unknown. The simplest explanation would be that it was created to relieve the monotony had the floor been all of one color or of one material. But it is common in European design, be it ancient or contemporary, that material and color vary, often accompanied by a change in texture to add to the richness achieved. Here an application of gold to wrought iron. The French gild their ironworks quite a bit, perhaps more so than Italians or Spaniards. Ribs placed at column points articulate a half-barrel vault quite obviously. This pinpoint support system focused structural content specifically where needed. The ribs could concentrate energy and reduce the rest of the vault to mere protective covering. It would seem that this is one of the earliest uses of such an isolated rib, in reality the forerunner of the flying buttress best known when seen on the exterior, and as we saw in the opening frames. This is another step in the direction towards articulated Gothic structural development. 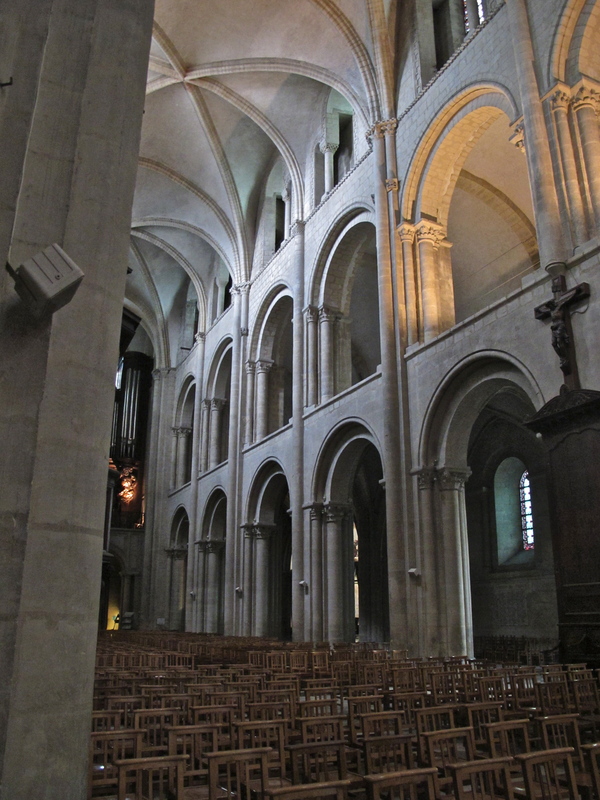 Note: Some history texts attributed the earliest flying buttress to structural supports within the triforium gallery at La Trinité (Abbaye aux Dames). Subsequent site inspection seems to invalidate such comments (see above in our discussion of the Abbaye aux Dames). There might be isolated ribs at columns under the roof of the triforium, but they are neither visible nor accessible, if they exist at all. 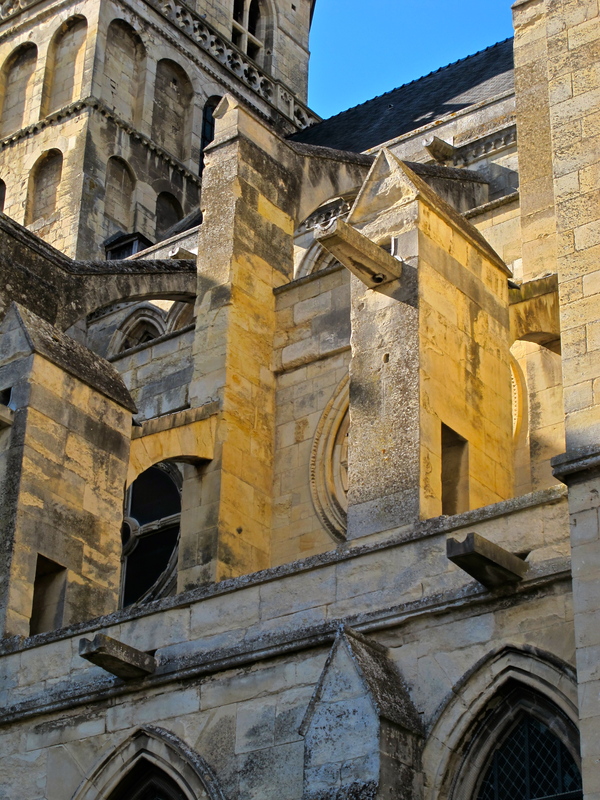 The actual isolated ribbed buttresses obviously appear here in the Abbaye-aux-Hommes. As noted above in discussing the Abbaye aux Dames, a planned visit to that church in the summer of 2011 might shed some light on what has become a bit of a controversial subject to this Professor..
As with all Romanesque construction, arches are semi-circular, in the Roman tradition, thus the name – we keep repeating it - Roman-like! 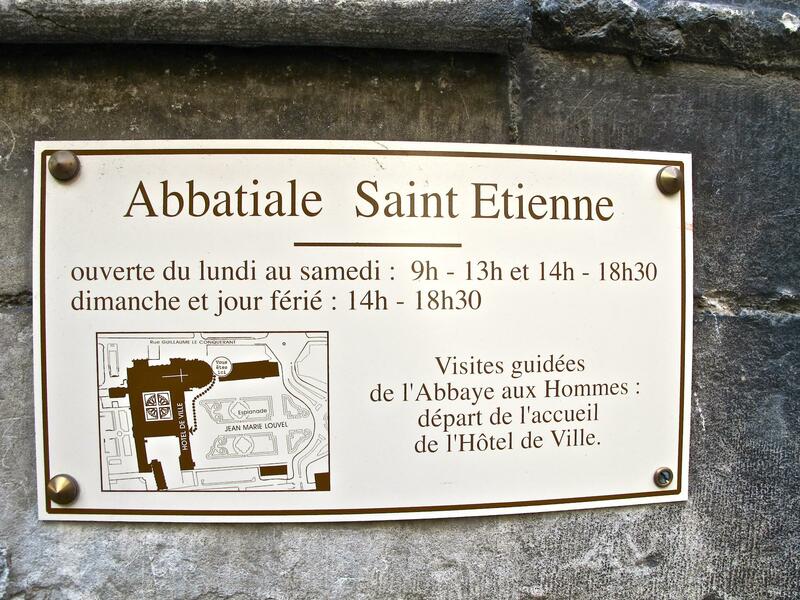 Reminder: do see the Abbaye aux Dames for additional information.